Join us for this year’s last Enrupt Innovation Talk that will explore intersection of innovation and liberalisation of electricity market which will be achieved later this year in Singapore. We will discuss new innovations, startup & corporate collaborations and how final end-users benefit. 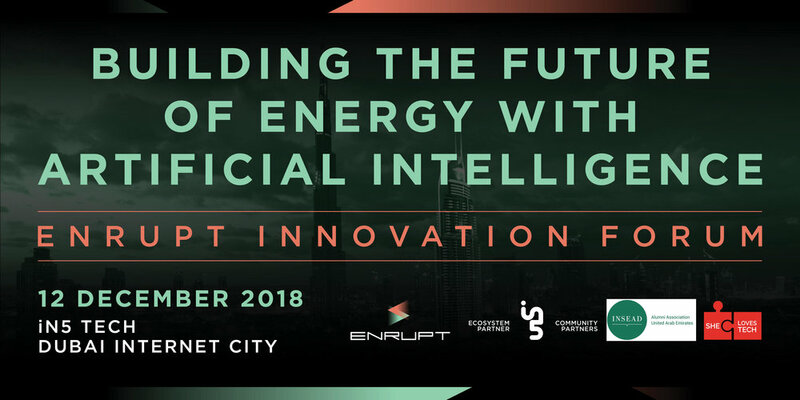 Enrupt is excited to launch its activities in the United Arab Emirates with this inaugural Innovation Forum on the topic of “Building The Future Of Energy With Artificial Intelligence”. We will be gathering industry and government experts, startups, energy and tech companies to explore the opportuniteis for artificial intelligence - based technologies in the energy sector. Join us to hear about different applications of artificial intelligence and explore how your organisation and you can benefit. You will hear from startups and industry experts what are different user case studies and benefits that the artificial intelligence applications can bring to oil & gas companies, utilities , clean energy and electric mobility companies. Watch the recordings of the events here. Join us for this session dedicated to analysis of blockchain applications across energy sectors: Oil & gas, utilities, renewables. We will explore what's already possible, what works and how can we work together between energy, tech professionals and startups. Do you want to improve energy efficiency of your assets? Are you looking for ways how to use new, innovative technologies? Join the next Enrupt Energy Innovation Talk on 13 September 2018. We will bring startups and industry representatives to discuss “Managing Energy Consumption with New Tech: The Next Opportunity”. Sustainable energy requires constant innovation to drive down costs, improve efficiency and reduce impact of energy sector on climate change. Startups can have an important role to play by advancing clean, decentralized and digital solutions for the sector. This event will mark the launch of a dedicated working group with SEAS that will prepare a white paper on startup innovation for sustainable energy in Singapore. Join us to learn more. The session will focus on the intersection of new tech and energy companies of the future, which will be distributed and running on a digital backbone. We will discuss what are the different technology solutions and what are the capabilities they bring and how they will change the business models. Energy storage is a key enabler for the transition from the carbon-based energy present to the renewables-based energy future. Join the EnRupt talk to learn more from experts in energy storage. The Philippines government has signaled support for increased deployment of renewables and fast tracking of off-grid and microgrid projects. However, regulatory challenges need to be tackled by anyone who wants to do business in this promising market. What value can energy start-ups bring and how can they best work together with local companies to bring clean and decentralized energy to the Philippines? This first Enrupt Energy Innervation Talk in Philippines in collaboration with Allotrope Partners and hosted by Aspace will shed light on the local market and lessons from abroad. Join us for this non-paid session that will answer your questions how to design your career transition and what does it take to succeed in this fast growing industry. How will electric mobility in Singapore evolve in the coming years? What will be the trend globally? Join the EnRupt talk to find out from top startups in the electric mobility industry. Decentralisation is changing the way we produce and consume energy. South-East Asia and its island nations is naturally a breeding ground for decentralised renewable energy. This session will present to you start-ups innovating in decentralised energy. Join us and be inspired to build the energy companies of the future. Artificial intelligence is already massively deployed in energy sector, with utilities and oil and gas companies alike. AI has been used to drive efficiencies and reduce costs. This inaugural EnRupt Energy Innovation talk will explore how AI will go further and change the way decisions are made in the energy sector. We will explore how AI can change relation between producers and consumers and create a new kind of energy system.